UPDATE: We’ve postponed this to a to be determined future date. 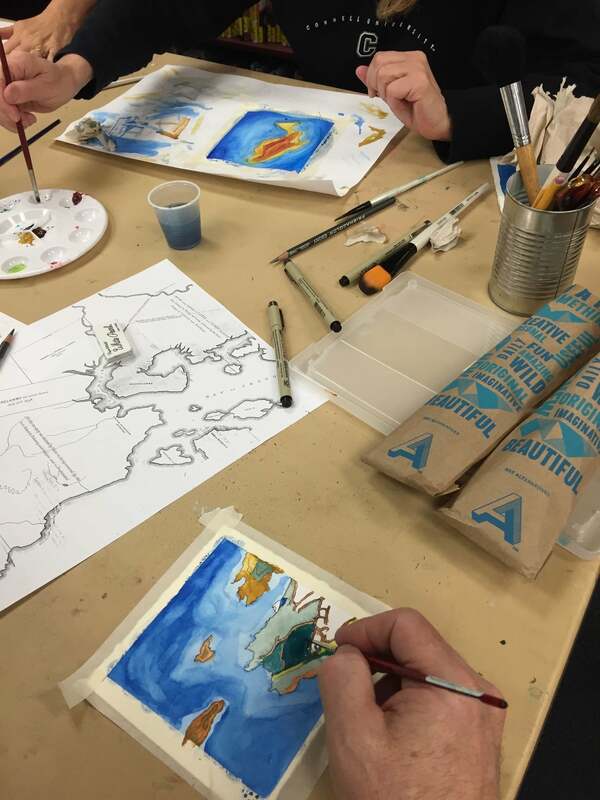 To celebrate Earth Day, come join Maine artist Molly Brown (MollyMaps) who will lead you through the steps to make your own hand-painted map of a special place on Sunday, April 23 from 1:00 to 3:00 pm at the Cook Memorial Library. This art workshop will be a mixture of personal sharing, town history, geography and art-making. The end result will be a beautiful mosaic of hand-drawn maps of places in town that are meaningful to local residents. Participants are asked to bring a map of their own favorite places. We will also have copies of local maps, both contemporary and historical, that participants can use. The workshop is being co-sponsored by the Green Mountain Conservation Group a seven town watershed organization dedicated to the conservation of shared natural resources particularly our drinking water resources and the Ossipee Aquifer. This workshop is for adults with all levels of artistic ability, and is limited to 20 participants. Please call the Cook Memorial Library at 323-8510 for more information or to sign up.